Quick Fix: Last Chance Catch! 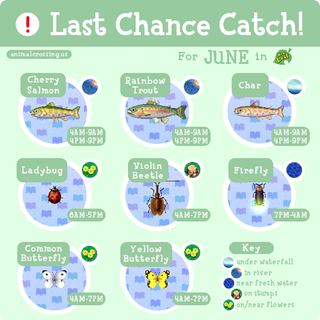 There is one week left in June, and that means there is one week left to catch these bugs and fish before they head off for the better part of the rest of this year. Good luck in your hunting, and I hope you all can manage to catch em before they're gone! Kinja is being difficult, and even though it's the exact same image, it's not posting as high a quality as you can see on the actual blog linked above. Check out the site for a more reader friendly sized image.